One year ago today, I hit the publish button on my novel, Ghost Thief, sending it onto Amazon for the world to read. It was a wild ride getting my first book published. From completing the first draft, the nervousness of giving it to my beta readers, seeing the manuscript printed out for the first time, seeing the first draft copy, to finally getting a box of the books that were to go on sale. I’ll admit that the book didn’t sell that many copies. Part of that was my fault. One of the big advantages of self publishing is that I don’t have an editor insisting on big changes to my story. The downside is that I don’t have a publishing company advertising my novel. This meant that I had to figure out how to get the word out about my novel – a task that I stumbled at doing. Of course, one of the reasons that I dropped the ball on advertising my first book was that I began writing my second book. I began with what I assumed would be two short stories to bridge the gap between books one and two. As I wrote the second story, however, I realized I was writing the opening chapters to Book 2. So I began writing Book 2 in earnest. In the past 10 months, I’ve written over 78,000 words for Book 2, making it much longer than my first book. At that pace, it’s about one printed novel page written per day. I estimate that Book 2 will be about 90,000 words when it’s done. Then again, these stories have a history of laughing at my estimates. They finish when they want to finish, not when I think they’ll be done. So when will Book 2 be published, you might ask. Well, if everything goes as planned, I could be looking at a May/June publication date. Of course, my previous statement about the story taking its time applies here as well. I could have a burst of writing and editing that cuts the time down, or I could wind up taking more time to get the story just right for publication. 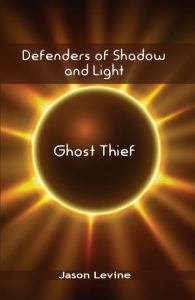 No matter what happens with my second (and third and fourth books – yes, I have ideas for those already), Ghost Thief will always hold a special place in my heart as my first published novel. To celebrate, I recommend downloading the first three chapters for free and, if they intrigue you, buying the book in paperback or Kindle.